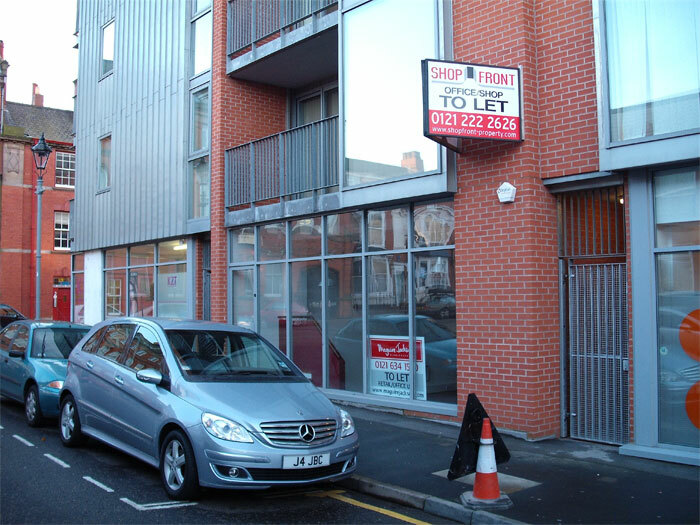 The property is situated on the ground floor of the Orb development on Tenby Street, at the heart of Birmingham’s Jewellery Quarter, close to Birmingham City Centre and the International Convention Centre. Excellent access is available to the National Motorway Network via the Inner Ring Road. Snow Hill and New Street Station are within easy access and the new Centro Station in Vyse Street is within walking distance, park and ride sites should be available. The Jewellery Quarter/Hockley provides an attractive business location, which has seen significant financial investment through the refurbishment of traditional period buildings. The environment is further enhanced by a mixture of restaurants, wine bars, banks, as well as numerous retail outlets. The Centro Bus 101 runs in Frederick Street directly to the City Centre. The unit provides a self contained ground floor retail unit benefiting from full height glazing to Tenby Street, WCs and kitchen. The accommodation is finished to a good standard. The accommodation comes with one car parking space, situated in the Orb garage. A new lease is available immediately at a rent of £12,000 per annum. This property has been elected for VAT. We have been advised that the service charge is currently running at £1.45 psf.